Growing in Grace Podcast: 479. 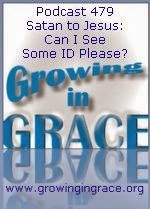 Satan to Jesus: Can I See Some ID Please? 479. Satan to Jesus: Can I See Some ID Please? One of the greatest battles for us in this life is the battle of identity. That is, understanding who we are as children of God. The first Adam lost that battle in the garden and the human race became identified as sinners. The last Adam (Jesus) came to offer the free gift of becoming God's righteousness and receiving life. This was made possible because Jesus won the battle of His identity. As a boy growing into a man, He believed and understood who He was as the Son of God and conquered on the basis of that identity. Jesus did not have to do anything to prove who He was. We can experience the same victory as new creatures in Christ.